In 1995, Dr. Eric Ellis began practice and opened 4Smiling's second office. Dr. Eric grew up embracing Dr. Joe's commitment, compassion and philosophy for dentistry, and he knew from a young age that he wanted to follow in his father's footsteps. Dr. Eric focuses on appearance enhancing aspects of dentistry, but specializes in cosmetic dentistry; implant restoration, preventive medicine and TMJ, neck and facial pain. 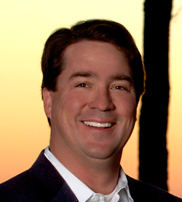 Dr. Eric received his degree in Dental Surgery from Baylor College of Dentistry in 1995, and his Bachelor of Arts from Austin College in 1991. He is a member of the American Academy of Cosmetic Dentistry, the American Dental Association and the Academy of General Dentistry. Dr. Eric has been named a Top Dentists by H Texas Magazine each year since 2005 and named one of America's Top Dentists 2005 -2010 by the Consumers Research Council of America. Dr. Eric was awarded the prestigious Partners in Peace award for his charitable contributions for survivors of domestic violence, and is a recipient of the Southwestern Oral & Maxillofacial Surgery award for Excellence in Surgery. Additionally, Dr Eric serves as director on several local area charities including the Bay Area Turning Point Foundation. "I was nervous about the procedure, about myself, about the look, about the finances, and about doing the right thing.The focused time we spent making a right decision helped reduce my nervousness. Once I made a decision I felt relieved. Confidence in myself has increased 2-3 times; as a person, who I am. You feel good, look good, it makes you feel good about who you are as a person. People treat me differently; with more respect. They admire me more..."
"If I had to do it over again, I would ! "Dr Eric helped my ego and helped me feel better about myself, I'm not reluctant about speaking out, I don't hide my teeth anymore." "My teeth are healthier, my teeth don"t hurt anymore, my gums don't bleed anymore, I don't have any toothaches- & I have a better smile, I get complements all the time on my teeth. They are so straight and pretty. I used to hate to get my teeth cleaned because it hurt. Now I love the feeling. Your teeth feel so good. When I clean my teeth at home I feel like I am one of those toothpaste commercials because when I finish I get that sparkle 'Bling-Bling' feeling."